Annual update to help job seekers find work and employers find the right staff. PEI Sector Councils address human resource issues and helps connect job seekers with employers. Atlantic Canada Aerospace and Defence Association represents the interests of nearly 200 firms in the aerospace, defence, marine, and security industries in Atlantic Canada. With four corporate staff based in Halifax, ACADA assists the provincial directors located in Charlottetown, Fredericton, Halifax, and St. John’s. Creative PEI is dedicated to improving outcomes and incomes of creative industry workers on PEI. The website shares information about careers in creative industries, government programs to help people enter a career in creative industries, research projects about careers in creative industries, and news about upcoming training and job opportunities. For more information, call 902-367-3844. Visit www.creativepei.ca. Funded in whole or in part through the Canada/PEI labour market agreements. PEI Agriculture Sector Council helps support a number of education and employment programs. The PEI Farm Team program gives students an opportunity to earn a bursary towards their post-secondary education while they earn a wage working on a farm. The program will help farmers and agricultural processing operations fill jobs this summer. Visit www.peifarmteam.ca. The Farm Technician Apprenticeship program two-year registered apprenticeship program combines classroom learning with on-farm experience, earning students a Certificate of Qualification in Farm Technician by the PEI Department of Workforce and Advanced Learning. Visit www.dal.ca and search Farm Technician program. Prepare socks, ropes, nets, and cages for finfish and shellfish. Tighten, clean, and mend lines, ropes, and nets. Operate equipment such as boats, cranes, forklifts, and feed blowers. Feed aquaculture stocks and report irregularities. Assist farm managers in culling and marking stock according to outlined procedures. Clean, maintain, and repair equipment and enclosures. Collect and spawn brood fish. Implement and adhere to farm safety protocols. For more information, contact the PEI Aquaculture Alliance at 902-368-2757 or email [email protected]. PEI BioAlliance offers information on career opportunities and tips for job seekers. Visit www.peibioalliance.com and click PEI Job Search. PEI Trucking Sector Council website includes information about careers in trucking, programs to help new candidates enter the field, and information about training in Atlantic Canada. It also provides up-to-date information about the many new and ongoing industry-related projects the trucking sector council is working on. Contact PEI Trucking Sector Council, Farm Centre, Charlottetown, at 902-566-5563 or [email protected].ca. Visit www.peitsc.ca. Tourism Industry Association of PEI (TIAPEI) Tourism HR Committee is an arm of TIAPEI. www.choosetourism.ca lists resources for employers, training and education, a job board, and more. For more information, call 902-566-5008. The following organizations have programs and/or services to help job seekers and resources for employers. The Adventure Group Inc. is a registered charitable, non-profit, experiential education and training organization incorporated in 1992 to address the needs of young people and their parents. The Adventure Group works with clients using an adventure based “learning by doing” approach, whereby participants are fully involved in the experience. Each summer, prevention programs are offered through a youth leadership delivery model where youth ages 15 to 25 are employed to work together to implement the program for children ages 9 to 14. Intervention programs are also offered throughout the year. Individuals identified as priority youth gain a multitude of skills that will allow them to set long-term life/career goals. This highly interactive experience will have a life-changing influence on the individuals who participate in this project, and will profoundly impact their children’s futures as well. Other programming includes one to five-day ROPES (Rite of Passage Experiences) workshops. Participants are given challenges to work through by problem-solving and opening their minds to issues like inclusion, diversity, teamwork, risk, trust, communication, community, and much more. These workshops are also used for team building for corporate clients. Customized sessions are offered any time of year. For more information, call 902-628-8668 or e-mail [email protected]. Funded in part by the Government of Canada’s Skills Link program. Career Bridges is a 12-week vocational assessment and guidance program for people considering a career change or further training. • Resource Centre with Internet access for job search and labour market research. • Confidential assistance with career planning, training, job search, and applications for funding. Canadian Mental Health Association (CMHA) PEI Division Clubhouse programs in Charlottetown, Summerside and Alberton provide recovery-focussed rehabilitation supports for individuals who have experienced mental illness. Based on an International Model of recovery, Clubhouse programs use a person-centred holistic approach that offers a variety of services and supports geared to the individual Clubhouse member. Clubhouse programs are committed to supporting individuals and their desire to return to the workforce. Clubhouse programs offer supports for members to access transitional, supported, and independent employment. In addition, Clubhouse provides a variety of employment supports and services such as career decision making, skills enhancement, resumè and cover letter development, job search, marketing, job coaching, post-employment supports, and employer education. For more information, visit www.pei.cmha.ca. Clubhouse programs are funded in whole or in part through the Canada/PEI labour market agreements. Community Connections Inc. provides a range of employment, residential, and support services to adults with intellectual disabilities in East Prince. They assist individuals to develop to their full potential, provide support to access and use community resources, and offer empowerment to contribute and participate in a meaningful way within their community. Community Inclusions Ltd. provides employment, residential, recreational, and training services to adults with intellectual challenges in western PEI. Some clients work for local businesses supported through the organization’s Employment Unit, while others attend day services at the Maple House Centre in O’Leary and the Tignish Training Centre. They operate residences in Tignish, Alberton, and O’Leary. They also coordinate various community-based residential placements throughout the region. For more information, contact Kevin Porter at 902-726-3144. Visit www.communityinclusions.com or search Community Inclusions Ltd. on Facebook. Employment Unit is funded in whole or in part through the Canada/PEI labour market agreements. Construction Association of PEI (CAPEI) has a new website called www.IslandBuilder.ca which features a job board and a list of programs for employers and job seekers. The HR Manager will meet with construction businesses, post open positions for them, and meet with job seekers. Island Builder-Team Construction is a program that helps unemployed Islanders 19 to 35 get skills training and find employment in the construction industry. For more information, call 902-368-3303. CAPEI Youth in Trades is sponsored by the Construction Association of PEI and is funded by Service Canada. The program, which is held in Charlottetown and in Summerside, includes 30 hours per week for eight weeks of employability skills and safety training in the classroom. Participants complete three days of orientation at Holland College and tour construction worksites. They are paid minimum wage (not insurable) for the classroom portion of the program. They also receive a 14-week paid entry-level work placement in the construction industry. Hours are insurable and the wage is set by the employer. Participants must be 16 to 30 years old, out of school, or working 20 hours or less a week. For more information, call the CAPEI office at 902-368-3303. The Skills Link Program is part of the Government of Canada Youth Employment Strategy and is funded by Service Canada. East Prince Women’s Information Centre in Summerside is a non-profit organization that provides services and community referrals for the women of Prince and Western Queens Counties. The centre’s Women’s Employability program helps women of all ages with job search and career counselling. For more information, call 902-436-9856 or e-mail [email protected]. East Prince Youth Development Centre provides services to youth ages 15 to 30, including youth employability programs, case management, applications for post-secondary studies, SkillsPEI funding applications, assistance with resumés and cover letters, daily updated Job Board, and computer/Internet access. For more information, call 902-436-2815 or email [email protected]. Harbourview Training Center Inc. in Souris provides a broad range of support services to clients with an intellectual disability. The center offers woodworking, bakery, and skills enhancement day programs, and assists and support clients to gain meaningful employment in the community. For more information, contact Judy Hennessey, Executive Director, at 902-687-3032. Inclusions East Inc. offers employment services such as needs assessment, case management, employment readiness, and job coaching to individuals with an intellectual disability in Kings County, among other services. For other Inclusions East services, contact the Executive Director at 902-838-2516 ext. 4 or [email protected]. Visit www.inclusionseast.com or on Facebook @Inclusions East. Job Bank is Canada’s one-stop job listing website. Each year, it helps hundreds of thousands of Canadian workers, job seekers, and employers connect on-line, and it is free of charge. John Howard Society assists Island offenders in the difficult transition from institutional to community living, including Employment Assistance Services. The individual and staff work together to develop an employability plan that meets the client’s needs. For more information, call 902-566-5425. Funded in whole or in part through the Canada/PEI labour market agreements and Community and Correctional Services of PEI. 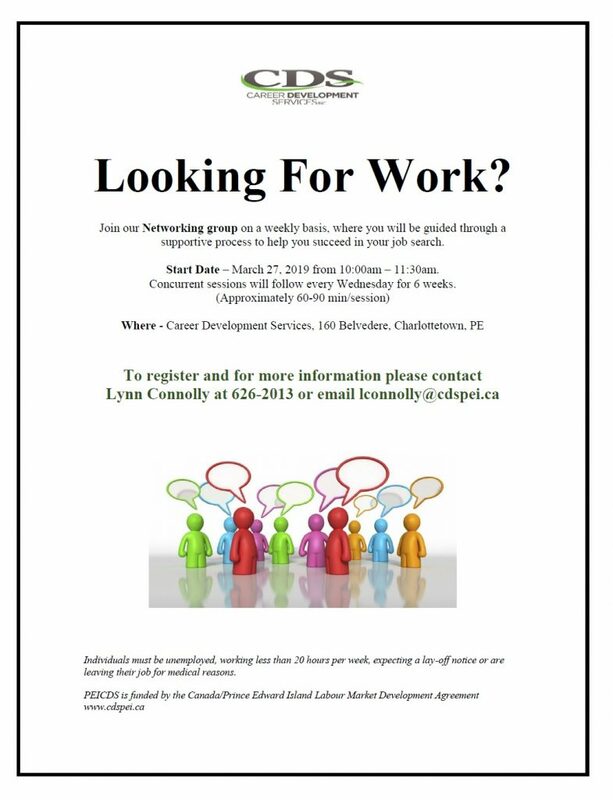 For more information, visit www.mcpei.ca or Facebook @MCPEI Employment Services. Funded by the Government of Canada Aboriginal Human Resources Development Strategy. The Council offers many other services, including resources for people dealing with addictions, health, family or financial issues. For more information, call 902-892-5314 or email [email protected]. Passport to Employment is a provincial government strategy sponsored by Tremploy, Inc. (Career Bridges). It is designed for Island workers ages 55 to 64 who wish to re-enter the workforce. Sessions are provided across the province throughout the year. Training involves five weeks of classroom time. Participants enhance their job search skills, increase their computer skills, receive personal awareness training and increase their opportunities for full or part-time work. For more information, contact Shelley Watts at 902-892-5338 or [email protected]. PEI Association for Newcomers to Canada (PEI ANC) Employment Assistance Service (EAS) Counsellors help newcomers overcome employment barriers in their search for work. They help identify suitable employment or volunteer opportunities and offer one-on-one career counselling. They assist with resumé and cover-letter preparation, job search and interview techniques, education and training options, and foreign credential recognition information. EAS offers pre-employment workshops for immigrants with various English levels, and offers ongoing support and guidance to get newcomers to Canada working. Charlottetown: 49 Water Street, Charlottetown. Funded in whole or in part through the Canada/PEI labour market agreements and SkillsPEI. PEI Council of People with Disabilities offers assistance with career decision making, career counseling, skills enhancement, and job search techniques, including resumé preparation, cover letter writing, and interview preparation. Job maintenance and pre-employment training are also available. They also do direct marketing, applications for wage subsidies, and job coaching. Career assessments and career exploration, along with job matching, are also provided. They offer a Job Club to assist with job search techniques and support. They also offer an Employer Speaker Series four times a year, where employers give information about their businesses, their hiring process, how to approach employers, and tips on interview skills. PEI COD is also the administrator of the Opportunities Fund Community Coordinator program. PEI Employment Standards enforces the rights and obligations of employers and employees concerning pay and wages, time off, sexual harassment policy, termination without cause, breaks and rest periods established under the Employment Standards Act, as well as the rules for youth employees under the Youth Employment Act. For more information, call 902-368-5550 or toll-free 1-800-333-4362. PEI Network is a free provincial service for new Islanders and new graduates who want to build a professional network. It’s important to network because 85 percent of jobs are filled through contacts and personal references, according to Brian Tracey, entrepreneur and best-selling author. Through PEI Network, qualified participants create their own networks of professionals, learn more about their field, identify job opportunities, get career advice, and become more rooted in their community. For more information, contact Alana Walsh, PEI Network Program Manager, at [email protected] or visit www.peinetwork.ca. PEI Public Service Commission There are many careers in the PEI provincial government, the health sector, public schools branch, student opportunities, and temporary work, and other areas of the public service. Apply online for all jobs with the provincial government. You can also choose to receive email notifications of current jobs opportunities. For more information, visit www.gov.pe.ca/jobs. For listings of student summer positions, visit www.princeedwardisland.ca/student-government–job-opportunities. PEI Reach Foundation provides a safe and structured environment for youth who have completed a treatment program and are currently in recovery from addictions and mental health issues. For more information, call 902-620-0000 or email [email protected]. PEI Seasonal Worker Skills Initiative is designed to meet the needs of Islanders who have exhausted their EI benefits prior to their scheduled return to work date. Step 1- Call 902-368-6280 for more information. Step 2- If interested, complete an application. Step 3- Your application will be processed as quickly as possible and you will be contacted regarding your training/work plan. Funded in whole or part by the Government of Canada through the Adult Learning Literacy and Essential Skills Program. 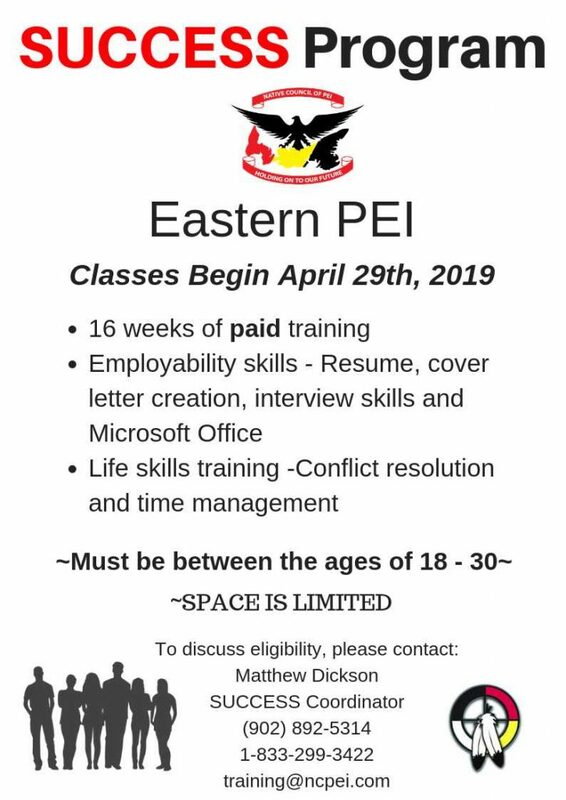 PERCÉ IPE is a program that enables PEI youth under 30 years of age who are enrolled in a post-secondary program (university or college) to take a paid eight to 12-week internship with a PEI employer working in a field related to their studies and interests. Bilingualism is considered an asset. A new program, Objectif Carrière Î.-P.-É. (PEI Career Focus) will help integrate 28 post-secondary graduates into the Island workplace through paid 24-week internships. Applicants must be under 30 years of age and ideally can express themselves in French. For more information, call 902-370-7333 ext. 402 or email [email protected]. The Prosper Program is a group-based employability skills program for unemployed individuals that will assist individuals in making a successful transition into the labor force through a five-week group-based classroom component and/or on-going employment coaching and mentoring. The program will target individuals who are receiving social assistance and/or disability supports, as well as Employment Development Agency and PEI Association for Newcomer’s clients. Prosper East, which will be delivered by The Adventure Group, will focus on but not limited to Agriculture, Tourism and Construction. For more information, contact Marlene Gotell at 902-213-1648. Prosper West, which will be delivered by the East Prince Youth Development Centre, will focus on but not limited to Agriculture, Tourism and the Fishing industry. For more information, contact Barb Broome at 902-436-2815 or Joyce Newcombe at 902-439-0865. The Public Service of Canada offers programs for university, college and high school students and graduates. Managers know that students who work under these and other programs can become invaluable members of their team. Federal Student Work Experience Program (FSWEP) is a temporary job program geared to secondary school, CEGEP, college, technical institute and university students. Coop/Internship program is a four-month work term program for post-secondary students. Research Affiliate Program (RAP) matches a student’s specific research interests with ongoing projects being conducted by federal organizations. Post–Secondary Recruitment (PSR)The recruitment program is for launching or furthering the careers of talented post-secondary graduates within the Government of Canada. Recruitment of Policy Leaders (RPL) The program is designed to attract and recruit post-graduates who want to contribute to Canadian and international policy-making. The program recruits exceptional leaders who have various backgrounds, experience, skills and competencies to help tackle Canada’s public policy challenges in mid to senior-level policy jobs. Ready, Willing & Able connects employers with job seekers who have intellectual disabilities or Autism Spectrum Disorder. For more information, call 902-394-7555 or email [email protected]. Rural Community Learning Inc. manages two employment resource centres in West Prince. The centres offer unemployed individuals assistance with preparing a resumé, cover letter, and filling out work application forms. There is access to computers, photocopier, and fax machine for employment purposes. Workshops are provided as needed. Stepping Stones to Success is a 12-week program offered by Rural Community Learning Inc. It is designed to provide youth between the ages of 17 and 29 with opportunities for personal growth and assistance in overcoming educational and employment barriers. The program focuses on life skills and employability skills. Participants take business and college tours, and professionals from various fields are invited to speak to the groups. Upon completion of the program, participants have either found employment, made a decision to continue to seek employment opportunities, return to school to further their education, or register for an Adult training program. For more information, contact Sharon Horne at 902-853-3715 or e-mail [email protected]. Visit Rural Community Learning on Facebook. Funding provided by Human Resources and Skills Development Canada-Skills Link Program. Skills Canada PEI is a non-profit organization to promote training and careers in trades and technology to Island youth. Skills Canada PEI, the provincial branch of Skills Canada, is a registered charity created in partnership with government, industry, educational and labour institutions. Its mandate is to encourage youth to consider skills and technology-based career options. SkillsPEI offers programs and services for job seekers, employers, and organizations. SkillsPEI provides assistance to unemployed individuals who are eligible for Employment Insurance (EI) and individuals who are not eligible for Employment Insurance (EI) to prepare for and find employment. Delivered by the Department of Workforce and Advanced Learning and funded in whole or in part through the Canada-PEI labour market agreements. Self Employ PEI is an employment program developed to help job seekers who want to launch their own business. This program provides financial support and business counseling to new entrepreneurs during their first year of operation. SkillsPEI offers Self Employ PEI information sessions for interested job seekers to find out more about the program. Stars for Life Foundation for Autism provides services and support in the community for individuals over 18 years of age with an Autism Spectrum Disorder. The goal is to provide young adults with daily living skills, continued education, supported housing, independent living skills, employment skills, and workplace opportunities. They provide one-on-one support with resumé building, job seeking, mock interviews, and visiting workplaces to determine work placements. With the clients’ unique challenges, it is important to find employers who can identify and make small changes needed to make the clients’ work experience successful. Education will help co-workers better understand this disorder. It will help them to go beyond the physical aspects to see the real person underneath. For more information, call 902-894-9286 or e-mail [email protected]. Student Work Placements – Work-integrated learning combines classroom learning and hands-on learning in a workplace. Employment and Social Development Canada will support partnerships between employers and post-secondary education (PSE) institutions to create more work placements for students enrolled in post-secondary studies across Canada. The program focuses on occupations in STEM and business that require a high degree of technical skill for which there are not enough qualified workers. Employer delivery partners that represent the interests of employers in industries related to STEM and business deliver the program, working with PSE institutions. These employer delivery partners will provide wage subsidies to employers who offer quality student work placements and will also help establish partnerships with PSE institutions to recruit students for these placements. Employers, including small and medium-sized enterprises, are encouraged to partner with local PSE institutions delivering programs in the fields of STEM and business to provide work placements for these students. Employers can receive wage subsidies of up to 50 percent of the wage cost for the placement (up to a maximum of $5,000 per placement) and up to 70 percent (up to a maximum of $7,000 per placement) for under-represented students including first-year students, women in STEM, Indigenous students, persons with disabilities and newcomers. Employer groups referenced above will provide wage subsidies. Post-secondary education (PSE) institutions delivering programs in the fields of STEM and business are encouraged to reach out to local STEM and business employers to provide more student work placements, as well as employer groups referenced above to increase partnerships. Students studying in the fields of STEM and business are encouraged to check with their PSE institution to see if placements are available to apply for. Trade HERizons: Are you a woman on EI, working 20 hours a week or less, on social assistance, or have no income? Are you interested in exploring career options in trade and industrial technology sectors? Trade HERizons is a career exploration and college prep program. For more information, contact Women’s Network PEI at 902-368-5040 or 1-888-362-7373. Tremploy, Inc. is a non-profit community-based organization that provides vocational training and support services to adults who have an intellectual disability. The Employment Assistance Program assists clients who are interested in finding a job. Services include skill assessments, skills training, individual job placements, employment counselling, job training and support to both clients and employers in the workplace. Assessments will be performed to assist in determining readiness for job placement. For more information about the Employment Assistance program, call 902-892-5338. Department of Workforce and Advanced Learning works with all ministries towards greater prosperity and enhanced employment opportunities for Islanders. The department is focused on the continued development of a skilled workforce, a culture of entrepreneurship, and the recruitment and retention of a talented and productive population. It also works to grow the population through the recruitment of newcomers, the resettlement of former Islanders, and the retention of young Islanders as long-term residents and citizens of PEI. WorkPEI.ca is dedicated to bringing together job seekers and employers on PEI under one convenient online destination. WorkPEI provides Islanders with information on government programs and services, including: access to training programs, financial assistance, employer supports, labour market information, and other related products and services offered by the Department of Workforce and Advanced Learning. WorkPEI is a production of the Department of Workforce and Advanced Learning and the Province of Prince Edward Island. Workplace Learning PEI Inc. provides Workplace Essentials Skills programs and services for employers and job seekers on PEI. Employers: Having difficulty finding people with the right skills? Is training is not sticking? Are employees making too many mistakes? It may be an issue that can be solved with Essential Skills training. The good news is that Essential Skills training is eligible for funding through the Canada-PEI Job Grant. For eligible applicants, the fund covers two-thirds of the direct training cost per person. Job Seekers: If obtaining certification (Red Seal, GED, passing a TOWES test, or other) is keeping you from getting a job, you can call us. The Workplace Essential Skills (WES) Program will help by building a plan that works for you and your schedule. For more information, contact [email protected].ca. Workplace Learning PEI also administers the WES Lennox program to adult learners from Lennox Island. Workplace Learning PEI Inc. is a non-governmental organization governed by a board of directors and funded in part by a grant from the Department of Workforce and Advanced Learning.